Olivia Jade’s Dad Has Been Scamming Since His College DaysMossimo Giannulli lied to his parents about attending USC. Lori Loughlin Apparently Hates What Everyone’s Saying About HerA source told People the actress is “outraged” by people discussing her alleged involvement in the college admissions scandal. Lori Loughlin Will Plead Not Guilty in the College Admissions ScandalThe document was filed this morning. Lori Loughlin Will Plead Not Guilty to College Scam ChargesAfter additional charges were filed. Hallmark Renews When Calls the Heart for Seventh, Lori Loughlin-less SeasonHow will Hope Valley carry on without its mayor? Why Did Everyone Pretend to Row Crew in the College Scam?Lori Loughlin’s daughters were allegedly fraudulently listed as rowing recruits to USC. Near, Far, Lori Loughlin’s When Calls the Heart Is Editing Her OutHallmark isn’t screwing around. Felicity Huffman Pleads Guilty to Fraud, Lori Loughlin Faces Conspiracy Charges“With deep regret and shame over what I have done, I accept full responsibility for my actions,” says Huffman. Lori Loughlin and Felicity Huffman Could Face Prison TimeAccording to reports, prosecutors will only accept plea deals that include prison time. Excuse Me But What Did Olivia Jade Know?“She would have never gone along with it if she thought this would happen,” a source said. Oh? Fencing Coach’s Fishy Home Sale Brings Admissions Scandal to HarvardThe Ivy wasn’t involved in the Varsity Blues probe, but a Harvard dad buying a coach’s house at a huge markup is drawing new admissions scrutiny. The First Parent Will Plead Guilty in the College Cheating ScandalThe organic packaged-food entrepreneur is just one of 33 parents charged. Lori Loughlin Signed Autographs on Her Way Into CourtShe’s facing fraud charges for her alleged role in the college admissions scam. Lori Loughlin and Felicity Huffman Are Expected in Court TodayWill the most famous parents in the college cheating scandal break their silence? Oh God, College-Decision Reveals Are a ThingThey involve cupcakes. Lori Loughlin Reemerges to Say She Can’t Talk About the College Bribery ScandalShe was in a friendly mood. SNL Has Some Primo College Recruits for YouThe Lori Loughlin method goes far. It Sure Looks Like Fuller House’s Ladies Are Supporting Lori LoughlinAunt Becky for life. USC Insists Lori Loughlin’s Daughters Haven’t Dropped Out of SchoolOlivia Jade hasn’t been seen, though. What You Missed From the College Admissions Scandal Affidavit Live ReadingOn March 19, Vulture brought together four comedians to perform a live reading from the college admissions scandal affidavit. Why Prosecutors Went Harder at the Parents than the Kingpin in Varsity BluesUsually the Feds use the little guys to get to the kingpin. In the college admissions scandal it was quite the opposite. What explains the turnabout? Here’s How the College Cheating Scandal Kids Have Responded So FarOf course one guy is using it to promote his mixtape. New York, Come to a Live Reading From the College Admissions Scandal AffidavitOn Tuesday, March 18, Vulture is hosting a live read from the college admissions scandal affidavit. Olivia Jade Keeps Losing Her Spon-Con DealsOn Friday, Estée Lauder Cos. announced they would no longer be working with Jade. The College Admissions Scandal Started With One Yale DadMorrie Tobin was being investigated in another case when he tipped off authorities. Will Olivia Jade Quit College Because of the Scandal?TMZ reports both Lori Laughlin’s daughters won’t be going back to USC. Colleges Can’t Fix Their Unfair Admissions Process on Their OwnPolicies like ending early decision and parental donations could help. But the admissions scandal shows it will take far more to level the field. Oh No — Do I Love Olivia Jade Now?An unfortunate outcome of the college admissions scandal. 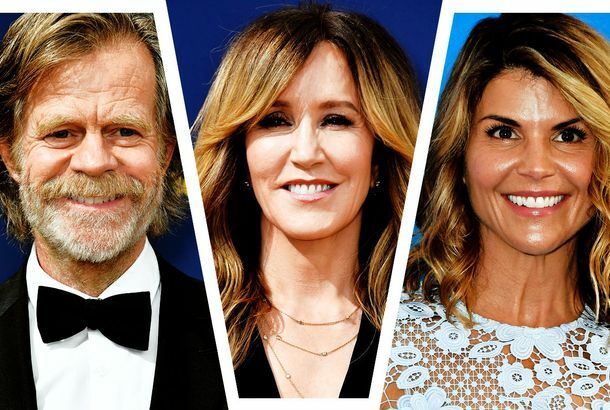 A Thorough Guide to the College Cheating ScandalEverything to know about the national college cheating scandal involving Lori Loughlin and Felicity Huffman. How USC Is Dealing With the College Cheating ScamAround half the parents involved reportedly wanted to scam their way into the California school. Angry Teens Are Swarming Olivia Jade’s Instagram CommentsAnd now they’re coming for her Sephora reviews. Lori Loughlin Has Been Released on Bail Following Her ArrestThe actress was freed after posting $1 million bond.